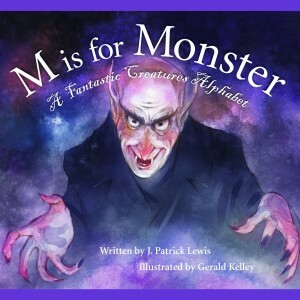 Teaching my son a love of books and reading is one of the great joys I have discovered since becoming a parent. He is lucky to have family and friends who gift him with clever books that engage him so completely that many of his first words came from books. Currently, we have a small corner of our living room devoted to our books. They fill vertical shelves that we installed to fit a corner that was dead space -tough to utilize because of a window on one side and a door on the other. 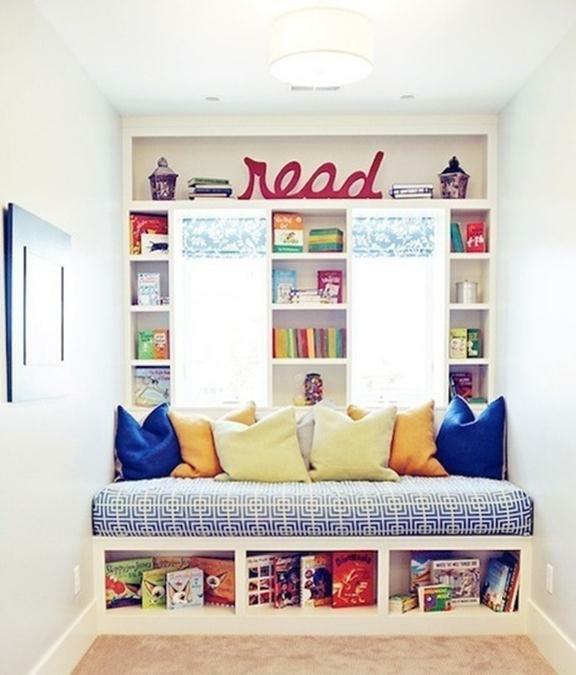 While this is a perfectly serviceable solution for our small space, I dream about creating the perfect reading hideaway for my boy. A cozy corner of his bedroom devoted to losing himself in stories. Pinterest.com is a great place to assemble ideas for this dream. I’ve been pinning ideas for the last year. Pulling bits and pieces out of different designs to implement when the time comes for the reality, I’ve created what I hope will one day become his imagination nook. 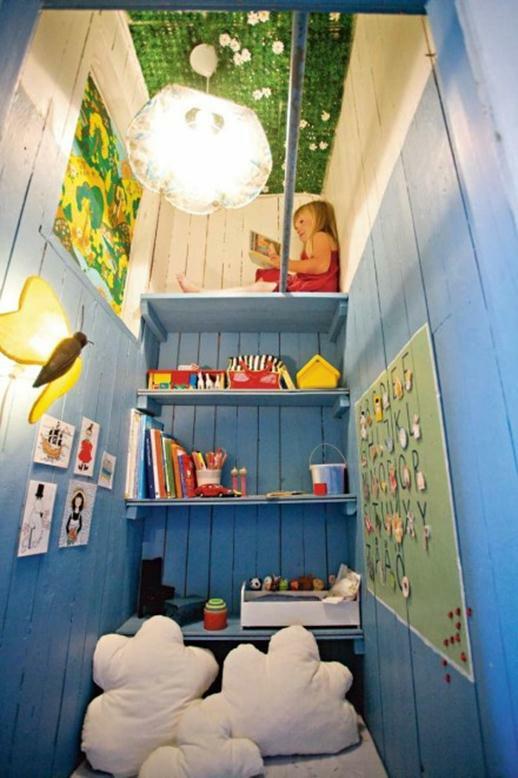 Because he loves to climb, I visualize a vertical space with a space for books, found treasures and space for his artwork. I’m just not certain how this little girl accessed her reading shelf. I would add a ladder. 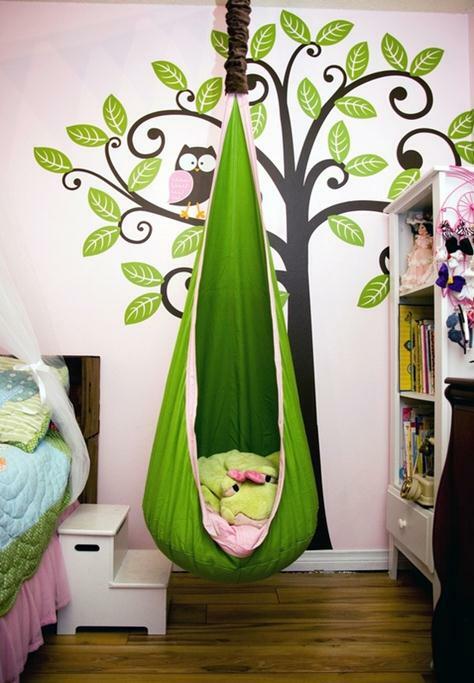 In our current home, this swinging seat might have to replace an entire nook. It would still give him a spot to cozy up with a book that would feel different from the rest of the house. If possible, I’d like there to be a lot of natural light, so he doesn’t strain his eyes. Also, so that he can pause and look out the window to dream about the world. In this picture, I like the books hanging from the ceiling. Excess books are being turned into great art, I’d like to include some book art in his space. If the vertical plan doesn’t work out, a window seat is a classic reading space. 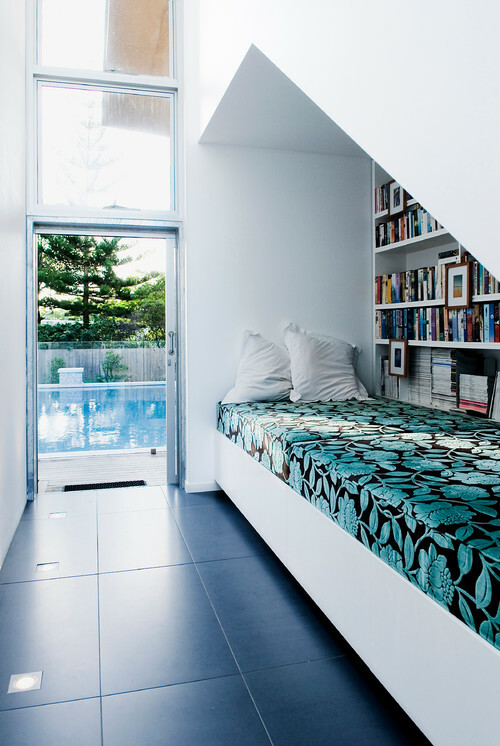 I like the built in shelves in this space. I know that it has been styled for this photograph, but I laugh thinking what it would look like after a child took control of the space. 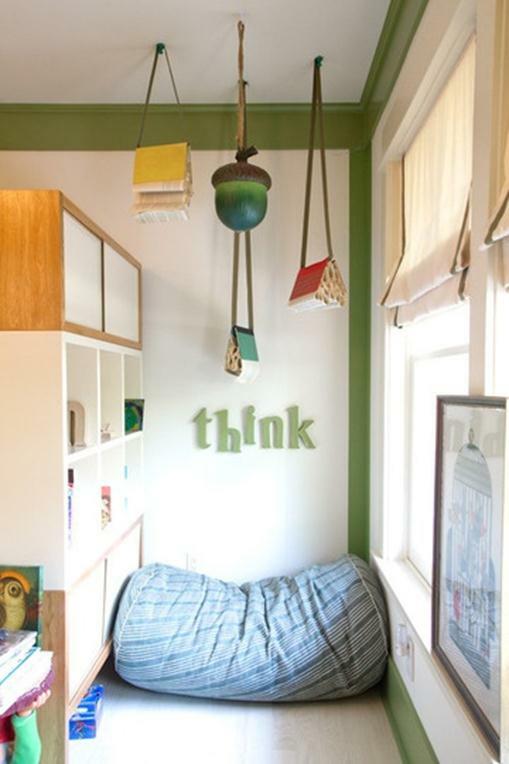 I think that’s the most important thing to remember when designing a kid’s space. An adult has a perfected magazine perfect concept that may last for one brief moment before the child takes possession. Then a beautiful chaos will ensue. That chaos is the point at which the child makes the space his or her own. It’s important to not become so attached to the design that you’re unable to let go and let the space become the child’s space. The Kindle is a phenomenal idea, but I’m still old school. I collect books of all genres and over the course of only five years, I’ve amassed a collection that is now piling up as four floor to ceiling stacks in my living room. On top of that, my mum recently called and gave me an ultimatum to stop by and pick up the books that she’s been storing for me since high school. Those books hold high sentimental value. Others may call it borderline hoarding. I can’t let my Beverly Cleary collection or my Calculus and Biology text books go to the dump. 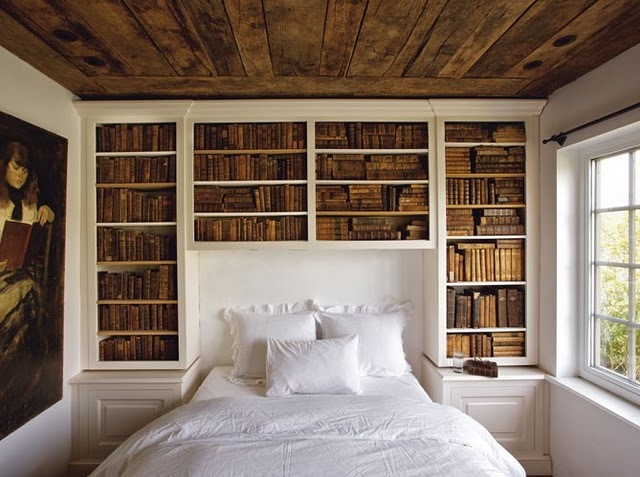 Being in the situation that I am in, I find the idea of decorating with books in the bedroom to be promising. The only drawback to a library in the bedroom is the need to clean more frequently. Books tend to accumulate dust and I just don’t have the time every week to pull all my books off and dust. I’d get distracted and start reading the books. A 30 minute task would turn into a 3 hour one. Martha Stewart has a great idea of adding the hair dryer to my dusting toolkit, but the idea of the dust falling in or around the bed is unsettling. 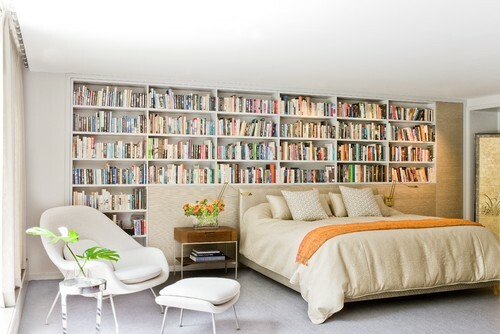 Lining my bedroom with bookshelves that are directed away from my bed may be one way to avoid this, as shown in the bedroom below. Even more than the cozy ambiance of the book collection, I really like the unexpected picture frame that is hanging off the bookcase. 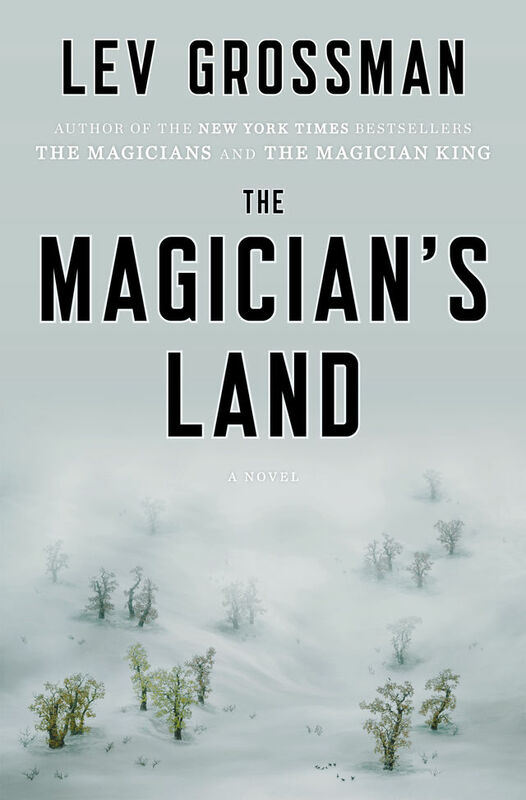 Everyone has their own preference and argument in the way they arrange their books. If your memory can’t even track what you had for breakfast, then organizing by author, title or category will be more suitable. When form prevails over function, arranging by color and size will keep the bedroom looking organized. An open shelf system to display my collection of books could easily lead to clutter. If there are enough books to fill all the shelves, then this next subject won’t be an issue. If not, a bookcase once meant to collect books could easily turn into a convenient resting spot for your stuffed animal or lost coins. In my previous blog, I talked about repetition, balance, and spacing. The same techniques apply here. When placing items on a shelf, keep an eye on the overall composition. If photos are added to the mix of media, keeping them in the same frame will help maintain order and symmetry. Avoid patterned bed linens. 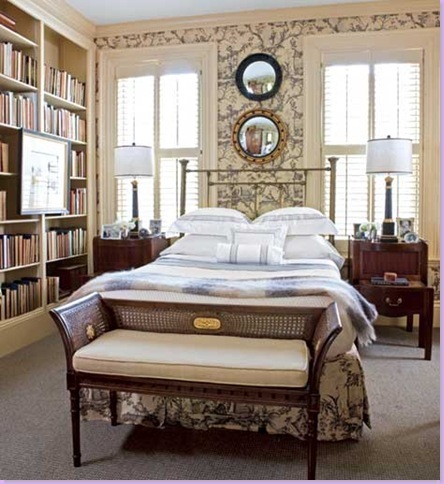 A plain ivory or white outfit for your bed will make sure the attention is drawn appropriately to the stylish shelves of knowledge.